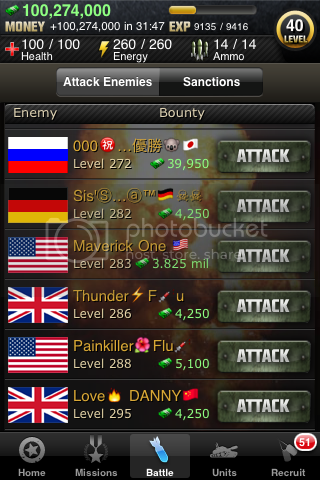 Storm8 World War for iPhone/iPod Touch and android phones, is a highly popular multi player online war game. Free to download from the Apple Apps and Android Apps Stores, it can be highly addictive. To ensure your enjoyment of the game, it's imperative you get the fundamentals of the game right from the very outset. If you don't, you could be liable to farming from stronger players or not have sufficient income to progress successfully. It can be very frustrating after you have progressed for a while to find your efforts have been in vain. Get it right from the beginning and you'll be set for the whole game. The idea of this blog is to share the basic principles of the game and thereby giving you a bit of a head start, but avoiding giving direct and exact measures to adhere to, which would otherwise take the enjoyment out of the game. 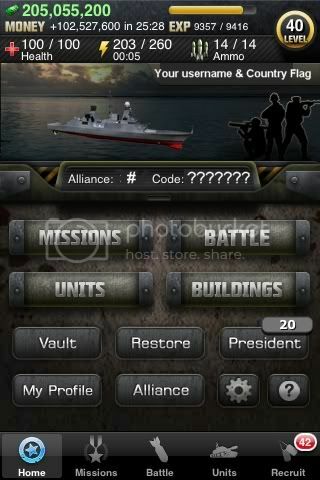 Missions are tasks you can do with the use of predetermined units, energy levels and alliance members. From Missions you earn cash, experience and sometimes loot normal or special units. These are the military units that help you in defending yourself from or attacking other players. All units are bought with in game money that you earn. Lower level units have no hourly upkeep, however, as you progress, units become more expensive along with their upkeep, with the exception of a few disposable air units. On this screen you will find players that are same level and about the same alliance size as yourself. You will only see players flying other country flags (you can't attack players flying the same flag as yourself). You can attack these players if you want. You will also see a Sanction button. Pressing this button will take you to a list of players from all country flags and various levels. 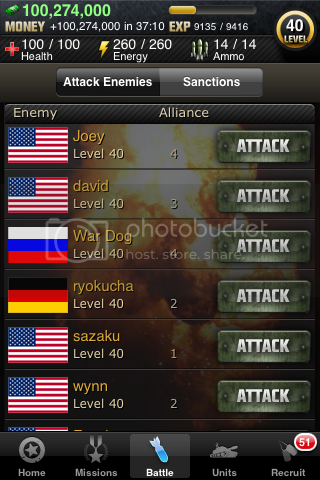 You can attack these players and if you kill them, you will gain the sanction reward. This is what determines if you can or can't attack. If your health is 27 or above, you can attack other players and they can attack you. 26 and below and you can't attack anyone and no one can attack you unless you are sanctioned. If you are unlucky enough to be sanctioned, your health will dip down to 0 and a death will be registered on your stats. Don't worry, you will automatically be revived to health of 1. You can restore your health if you have money in your vault and you go to the restore screen from the home screen. You only need energy to complete Missions and nothing else. If someone upsets you or you upset someone, sanctions can be used. If you want to sanction someone, you will need to pay a predetermined minimum amount, depending on your level. 10% of this is used as a 'fee' by storm8, so the person who makes the kill will receive 90% of the amount you put up for the sanction. Don't use sanctions light heartedly. Players will get annoyed if you sanction them for little reason and you could then be subjected to a mass of sanctions from the player you sanctioned and worse still, he could call in his alliance members to attack and sanction you. This is a term used when a player continuously attacks another player and 'milks' them of their cash. Hence the name 'farming'. Players who are attacked like this are known as 'cows' by the attacking player. There is no rule of thumb as to how many times you should attack another player without being considered to be farming, but most players accept that more than 3 attacks in a 24 hour period could be classed as 'farming', others will tolerate even more attacks. If you are farmed, under no circumstances should you comment on the farmers comms because then he will have a direct 'hard' link to you that he can come back to whenever he wants. The first thing you need to do is generate income from income buildings. When you first logged on to the game, you where given cash to start you off. Invest this money into income buildings and then either wait until that building generates enough money to buy more or you can complete some Missions to gain extra cash to invest. However, don't do too many, otherwise you will level up too quickly. Level 5 or 6 would be good places to camp for a while. As you progress through the levels, you have the option of buying different, more expensive buildings with a higher income, to get the best ROI (return on Investment), it will pay you to invest in a good spreadsheet especially designed for the game. I use JustCalcIt at a cost of $1.19 from the apps store, but there are some good free ones to download from the Storm8 Forum. When you have a reasonable income, you need to start building your defenses with defense buildings. If you invest well in defense at the start and continue invest as you play, it will help you no end throughout the game. In the early stages of your game, it's imperative you control how many alliance members you accept because with too many it can restrict your income resources and you will be liable to attack from potentially much stronger players. The first thing is to post your alliance code on YOUR OWN comments wall, then if and when other players read it, they can request an alliance from you. 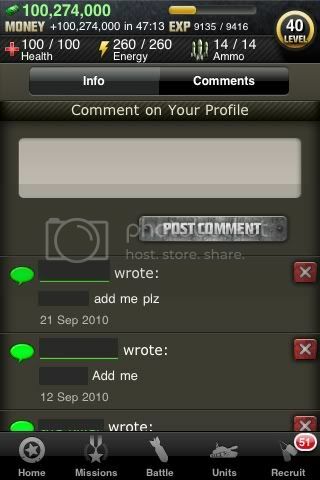 It's also good to post your code in the Storm8 forum under the appropriate thread, to attract more requests. DO NOT POST ON OTHER PLAYERS WALLS AT ALL because this will give other players, especially farmers, permanent links to you. If you receive requests from other players either on your comments wall or through the alliance request screen, don't reject or delete them. Keep them for the time when you need to build your alliance, later in the game. I would suggest a maximum of 4 alliance members until you reach approximately level 65, when the alliance brackets start to break. Keep a low profile, don't leave comments or respond in any way to attacks or sanctions, keep your alliance to 4 and continually build your income and defense. No - I have an alliance of 2 bcs I want wins thru my grater building defenses. And I am level 51. Is it possible to gain more than 110 million per attack from an opponent, if so what amount have you achieved? hi there have you ever heard about some so stupid (like myself) i need a perticular loot to contine a mission but i happend to sell it for some unknow reason. and i can get it back by looting because the mission that i get the loot from is already at 100% and i cant finnish the campaign because im missing the loot i need to finnish. Any way to overcome this more then to reset my account ??? any ideas i havent found anything about this in any FAQ. Any ideas will be much appriciated. You can replay the mission you looted the particular item form to regain that loot. I messed up and sent a comment to some one who is farming me. Can I change my name to get hime to stop? Having 4 alliance is the worst thing you can do. People with low alliance get farmed. Always have max alliance for your level and build up defense and income. This might take a while to get going but it will be better in the long run. to satellite internnet it can tend to work at slightly higher speeds than dial up but still tends to come with many limitations. I will right away clutch your rss feed as I can not in finding your email subscription hyperlink or e-newsletter service.